What Do Trojan Viruses Do? | How To Prevent Trojan Attacks? What Do Trojan Viruses Do on Computer Systems? This malicious software is also known as the Trojan. It disguises itself as a friendly and useful program or file. In the long run, it steals, damages, or even spies at your computer system. Do you notice that your computer is showing you all sorts of pop-ups and messages? It doesn't matter if it's an advertisement or a message saying your PC is infected. You can sure now that you starting to feel the Trojan horse virus symptoms. You may have contracted a fake antivirus or a spyware onto your system. If you think that having too many files and running multiple applications all the same time can slow down the computer, it's not the only cause. A Trojan horse virus symptoms can also cause that slowness because it must be using many resources. One of the Trojan horse virus symptoms is a slow Internet. Many times, you might not be able to connect to it either. When you know that everyone else in the house or office can connect, be warned. That's one of the Trojan horse virus symptoms. 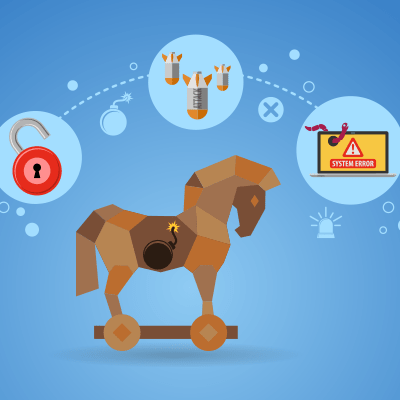 When you're infected, the Trojan horse virus could be connecting to a URL or opening separate connection sessions. Because of that, it reduces the available bandwidth or it makes it hopeless to use the Internet. An application you really need isn't working at all after minor troubleshooting must be one of the Trojan horse virus symptoms. Some programs can work but some of your programs is won't. You should go check all of your security tools and system to be sure. Are there unwanted windows and browsers that display pages? This is a strong indication of a Trojan horse virus symptoms. The unwanted redirection of traffic to another deceitful website. This can trick you to use a fake website which you won't notice at all. This is one of the scariest Trojan horse virus symptoms. Your important files that are missing might have been manipulated by a Trojan virus. The Trojan horse can delete or encrypt information, or move your files to another place. You should be worried when this thing happens to you. Your computer language suddenly changed without your knowledge. It's a giveaway Trojan horse virus symptoms. Your screen can also show back-to-front and other strange activities can tell you that you have an infected computer system. It's not only files that can disappear in your computer, your antivirus and firewall functions can be turned off during the Trojan horse virus attacks. This makes your computer a lot more vulnerable to cyber attacks. A serious computer security issue is already happening and you should react to it quickly. Your computer starts to become a hot mess. You notice that it's sending emails and having Internet sessions on its own. You're definitely experiencing Trojan horse virus symptoms. An ordinary antivirus might not be able to do a great job at detecting Trojan horse virus at your computers. The Trojan horse virus symptoms can't easily be detected because it pretends to be a legitimate file or software. That scheme makes it harder for a general antivirus to detect it. What you need is the specific Trojan horse virus protection that can eradicate such pesky Trojan horse virus in the computer. All you need is to use the Advanced Endpoint Protection to fight the Trojan horse virus symptoms. It is the next-generation cyber security that blocks bad files and automatically contains unknown files in a virtual container using Default Deny Platform™ and containerization technology. The unknown "contained" file is analyzed and an accelerated verdict is obtained through the Valkyrie cloud-based advanced malware analysis platform. It gives you the Trojan horse virus protection. Comodo Advanced Endpoint Protection gives a lightweight, scalable Default Deny Platform with a unique endpoint security approach. This results in complete protection and enterprise visibility. The app based platform removes the difficulty in using and solving the issues. Provisioned in minutes, Advanced Endpoint Protection also contains unified IT and security management console, that through an app enabled platform reduces the effort of managing your Android, iOS, OSX, Linux, and Windows devices, on every segment of your physical and virtual networks.